Convicted murderer Earl J. Clark was granted a stay of execution today as his appeal twisted its way through the State Supreme Court. There was a time when Clark’s chances to avoid the gallows seemed promising; however, following an escape from prison, things were looking grim. 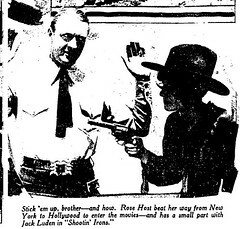 It all began in April of 1925 when Clark, a handsome, half-Cherokee bootlegger, stabbed Charles Silva, a Filipino sailor, in a dispute over a girl. The girl in question was 17-year-old Mamie Stephens, herself a fugitive from justice since her escape from a girls’ reformatory the previous October. Though accounts varied, when the three met at Clark’s home, Stephens apparently wore a red rose in her hair as a sign to Silva that she would leave Clark for him. Tempers flared, and Clark refused to let Stephens leave the house. When Silva stepped in to help her, a fight broke out, during which Clark stabbed Silva in the gut. Silva apparently did not realize the severity of his wounds, and died later that night en route to his ship. 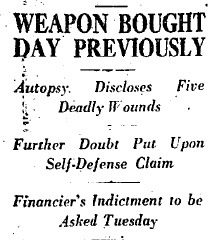 The papers dubbed the case "the Red Rose Murder" and Stephens "the Red Rose Girl." In July of 1925, Clark was sentenced to hang, but his attorneys immediately initiated an appeal to save his life. The appeal before the State Supreme Court was repeatedly delayed while Clark languished in the Los Angeles County Jail. On March 16, 1926, just days before his appeal was scheduled to come before the court, Clark and five others escaped from jail. While the five were quickly captured, Clark managed to go into hiding for over nine months. He was finally found in Minot, North Dakota, the proprietor of a paint store across the street from the local police station and husband to the daughter of one of Minot’s leading citizens. Following his extradition to California, Clark was resentenced to death; however, his attorneys had the appeals process reinstated. However, it was all for naught. 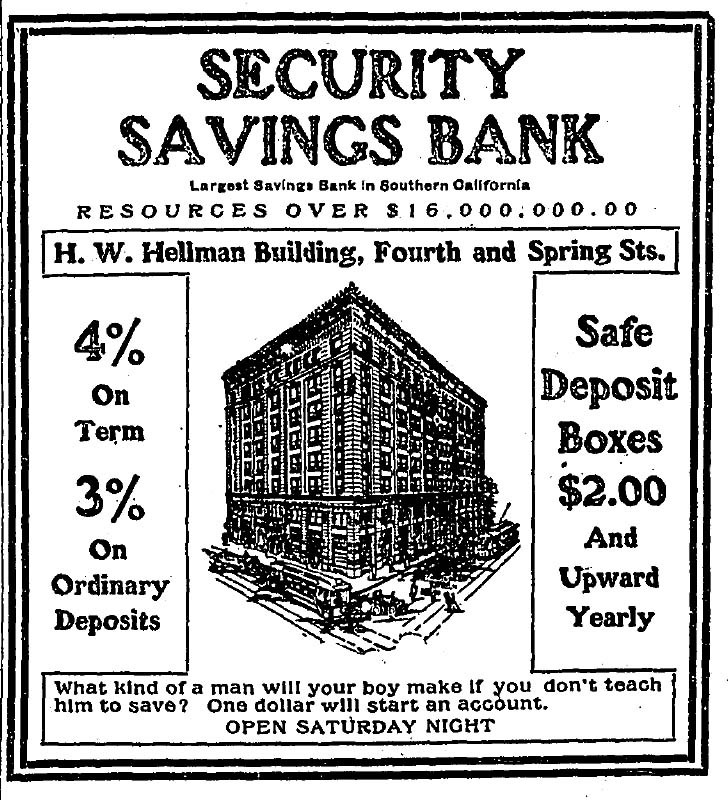 Clark’s appeal failed, and his hanging was set to be carried out September 23, 1927. Helen Scofield Clark, Clark’s 19-year-old wife, wept openly upon hearing Clark’s fate, saying, "I’ll never believe he is guilty." However, she was not present for the judgment, having been forbidden by her parents to travel to California for the trial. Clark was set to be hung alongside Joseph Sandoval, a Ventura man who had murdered his wife in a drunken stupor, but Sandoval’s sentence was commuted by Governor Young the night before the execution. Clark received no such clemency. On the gallows at San Quentin, he cursed the crowd of about 100 spectators who had gathered to watch the hanging, and as the black hood was placed over his head, whispered to his executioners, "Make it snappy." Los Angeles police officers took up a collection for Clark’s widow so she could have the body shipped to Minot for burial. 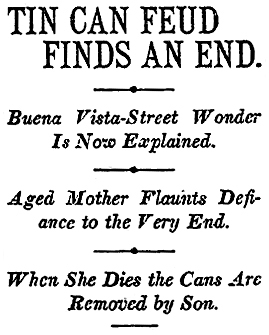 She accepted the money, but not Clark’s remains. No one else claimed them either, and he was subsequently buried in the prison cemetery. Led by I. Newerf and J.B. Dudley, the automobile owners of Los Angeles are fighting a new city ordinance that bans parking within 40 feet of downtown intersections. Newerf, the West Coast representative of Goodyear Tire Co., and Dudley, a car salesman, received citations for violating the law and have pleaded not guilty. In April 1909, Dudley pleaded not guilty to involuntary manslaughter after hitting street inspector Woodman J. Thomas on Broadway near 5th Street. 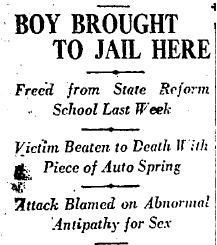 He was sentenced to five yearsâ€™ probation in March 1910. La Doux told police that she and Rogers used a scheme in which she took a job with a reputable employer and passed clientsâ€™ information to her lover. La Doux said she worked at a department store in Oakland and a dentistâ€™s office in Los Angeles, turning over names to Rogers, who forged the checks. â€œShe had been an honest woman, she said, until Rogersâ€™ oily tongue and smooth ways captivated her and she became his mistress and then a thief,â€ The Times says. In testifying against him, â€œShe recited a story of shocking cruelty, saying that she had been mistreated, scorned and finally beaten by the man who promised to love, cherish and protect her,â€ The Times says. Flood did not dispute any of the charges, refused to cross-examine her (a husbandâ€™s right in those days) and pleaded guilty to battery. â€œHe admitted that he struck her and confessed to having assaulted her with his fist as she lay on the floor,â€ The Times says. Flood skipped town in September 1907. â€œHe made the acquaintance of a fast sot and spent plenty of money, too much, in fact, for a man of his means. Late suppers at swell cafes cost Flood much cash. Then he became possessed of a desire to take long journeys in touring cars. He paid his bills with other peopleâ€™s money, the new restaurant manager says, by levying on the cash drawer of the restaurant, which is owned by a company,â€ The Times says.